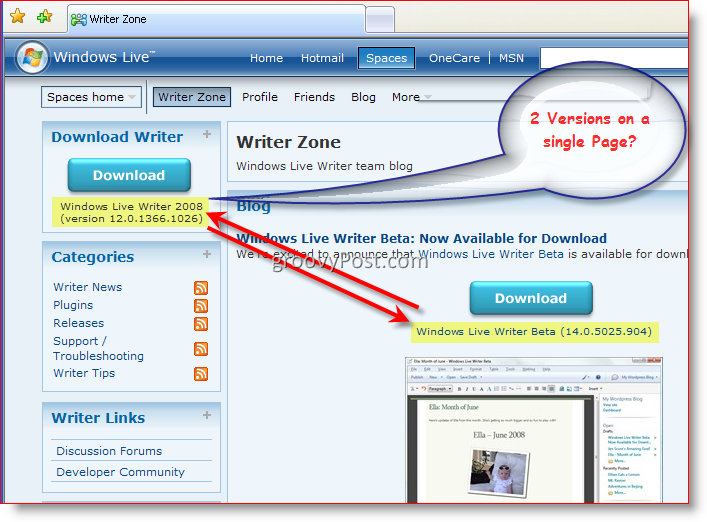 Today when I launched Windows Live Writer I was prompted to install the latest beta from Windows Live. 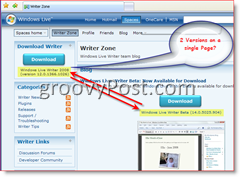 (FYI – Windows Live Writer is a Free Offline Blogging tool similar to Microsoft Word which allows you to Write Blog Posts/Articles – just like the one your reading now – and then upload the Posts to your Blog/Website. Very slick tool if you have a Blog or SharePoint site.) In any case, I was running build – Technical Preview 14.0.3913.522 and since they offered the new build – Beta 14.0.5025.904 I figured hey, why not! What could go wrong? Well, quite a bit actually. The first try the install took about fifteen minutes, and then my Hard Drive filled up (despite the fact I started with about six Gigs of space.) After the drive was full, the installer died. My second try I freed up some space only to have my Hard Drive fill up again. (Hey didn’t I just free up two gigs of drive space?? How much space does this new Live Writer need anyway???) After realizing there must be a MAJOR bug in the 14.0.5025.904 installer, I finally managed to get everything installed once I figured out what the installer was doing. What was it doing and how did I fix it? Well, I’m glad you asked!!! :) Let’s take a step back and discuss the play-by-play. Tip: If you want to skip the insanity from Microsoft – Skip to the bottom “Problem Solved” for the fix to the Installer Bug. Where is Live Writer? Microsoft? Google? So, where was I… Oh yeah, I launched Windows Live Writer to write a “GROOVY How-To Tutorial about How to lose complete control of all data by using Google Services” when I was prompted to install the latest build of Windows Live Writer. Rather than just click “Upgrade,” I figured I would first do some searching around to make sure they were offering the “Latest” version. One thing I learned over the last year working with Windows Live Writer is they still have a LONG way to go when it comes to releases. 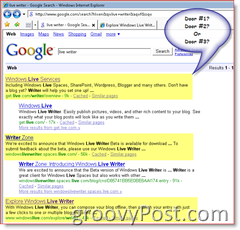 So I opened up GOOGLE and did a search for Live Writer. 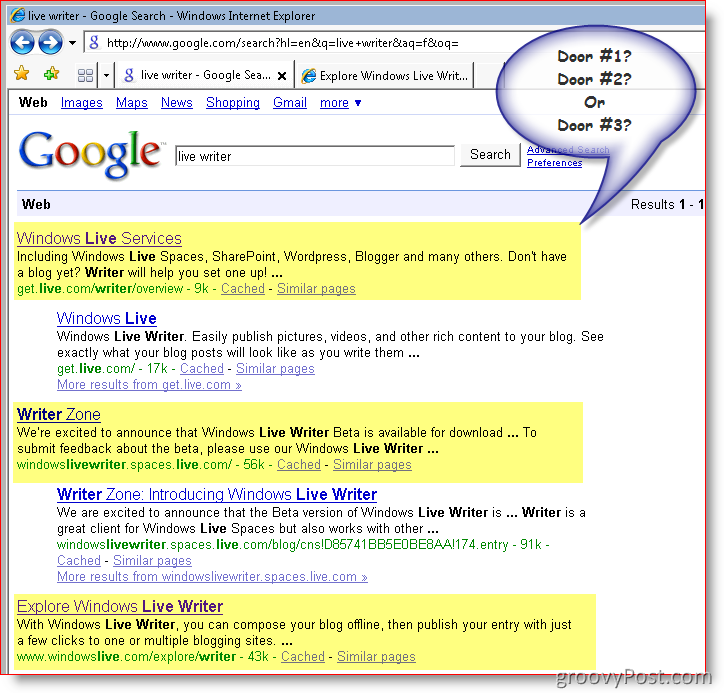 The first Link – http:// get.live.com/writer/overview must be the right link right? Nope. I logged onto a test box and tried out the link. The link took me to a page that LOOKED right, but it was WRONG. I clicked the Get it Free button, and it prompted me to download WLinstaller.exe. So, thinking this must be it, I downloaded it and ran the installer. Unfortunately, this installed an old version of the software – Windows Live Writer Version 2008 (Build 12.0.1366.1026.) Granted, this is probably the last “GOLD” version, but it is far from Version 14.x that I was seeking. The next Link – www.windowslive.com/explore/writer. 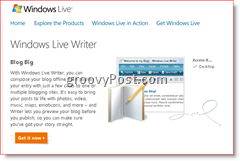 This time I get a fancy page from Windows Live with another Button – Get it now. So I figure this MUST be it and I click on it. This time it makes me log in with a Windows Live account. After I log in, I get a Download now button which prompts me to download WLinstaller.exe again. So I grab my test box again and download the installer. Sure enough, I get Build 12.0.1366.1026 again. Ok… Now I get it. This build must be the GOLD version they want people to release. I must have been running a BETA version on my production box (Build 14.0.3913.522). I didn’t realize that. Ok, I’ll hit the blog and see what I can find! be a bit confused which version they want us all to install. 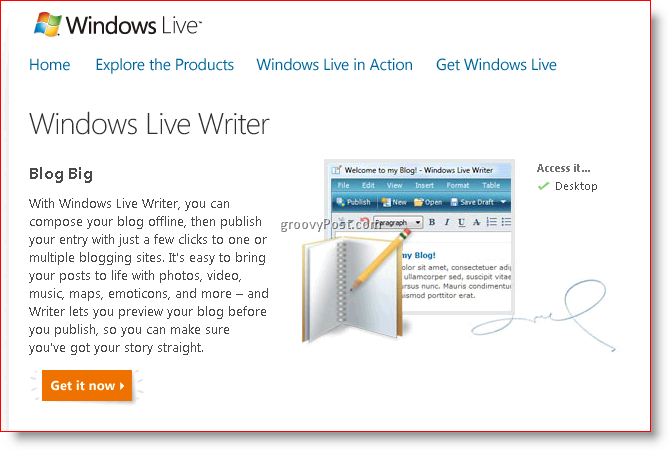 Right there on the top of the Team Blog page is two different versions of the Windows Live Writer. 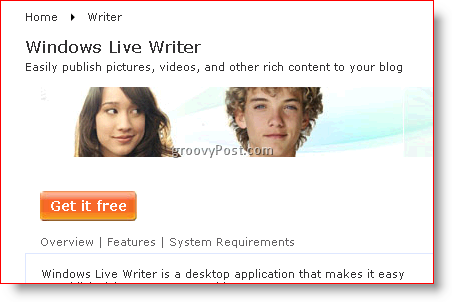 Hmm, perhaps they just “missed it?” Perhaps they don’t realize how confusing this all is by having 3, 4, 5 different sites just to get a copy of Windows Live Writer. Or perhaps they need a release manager. That’s my bet! The installer asked if I wanted all the other Live Beta Software and I said no. “I NEED TO WRITE A NEW GROOVY HOW-TO ARTICLE BEFORE I GET TOO TIRED!” So after selecting just the Live Writer Upgrade, the installer was off and running! And Running! And running. After about fifteen minutes I received a Pop-up that my C: drive was almost out of Hard Drive Space. HUH? That’s odd. I could have sworn I had plenty of space. Odd…? I opened up Windows Explorer and found my C: Drive only had 180 Megs of drive space left! Wow! That’s not good. I spent the next ten minutes cleaning things up and blowing away old downloads (and other junk) and kicked off the installer again with 2+ gigs of free space. This time I watched my Drive Space and sure enough, within about two minutes I was back down to 150 megs of free space and the installer once again died. Weird. Either Live Writer is downloading data like a banshee (Remember? I have Verizon FIOS so things move very quickly! ), or it’s copying a bunch of temp files somewhere. Fortunately, having just written an Article about a cool Tool called TreeSize, I knew it would take just a few minutes to find out where all my space was going. Sure enough, after kicking up TreeSize, I ran a report and found that each time I ran the Windows Live Writer Installer, it copied ALL files and folders sitting in my Desktop Folder (c: documents and settingsmrgroovedesktop) folder into a temporary folder (C: Documents and SettingsskrauseLocal SettingsTemp100322000000163c2t6uk1qz5qlocated). This report explained why my drive kept filling up. 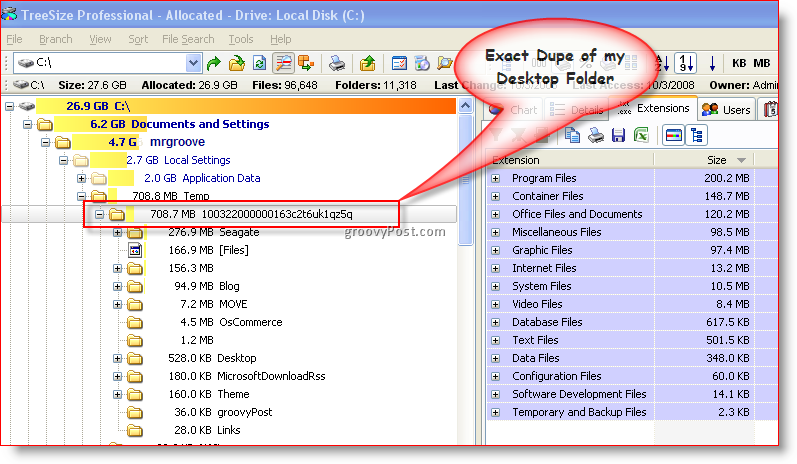 Since I ran the installer twice, I had two temp folders which contained duplicates of my Desktop Folder. Well… almost duplicates because my drive filled up before the copy could finish which explains why the installer died. So, I have no idea why the installer feels it must copy the Desktop Folder into a Temp folder. But, if you have the same problems I did (Install takes a LONG time, drive runs out of space, install aborts) you probably have a lot of data in your Desktop folder that you need to clean up. Clean that up, delete the data in the TEMP folder that Windows Live Writer created, and kick it off again. You should be good. Thanks for investigating this — I didn’t delete my temp folder and didn’t run into the “hard drive fills up” prob, but I DID uninstall the previous Live Writer, then try the new installer. Yeah it can be pretty confusing, infact the two installer files from microsoft even share very similar names. Luckily the more recent one will tell you that the programs it will download/install for you are beta, however it still doesn’t tell you what version is installing. i ve only old version of msn. so please update the latest version of msn in my computer.